Make your own magnetic dry erase board! Our Magnetic Material with Write-On Wipe-Off Face can be drawn on with a dry erase marker and removed with a dry cloth. Perfect for menu boards, custom made To-Do boards, dry erase boards for classrooms and much more! This looks like a magnet roll but it is not a magnet! it will not stick to metal! It is a magnetically receptive material that attracts all types of magnets! You'll just need to remove the release paper from the back and you can stick it almost anywhere! and once you adhered it to the wall you can put other magnets on it! it will attract all other magnets! 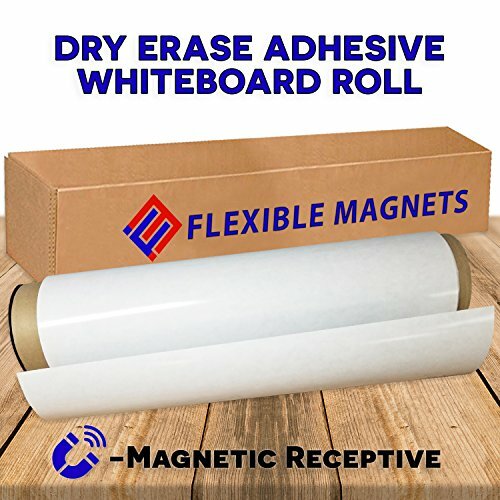 It's the perfect high-quality adhesive whiteboard magnet that will attract other magnets! Cut the Magnetic Material into the size of your liking! Decorate the material edges with a wood frame or colored vinyl! Fast free shipping! PREMIUM QUALITY- Magnetic dry erase board with Write-On/ Wipe-Off Face on one side & adhesive on the other. Each roll is 30 mil thick & measures 12" x 24". MAGNETIC RECEPTIVE- This looks like a magnet roll but it is not a magnet. It is a magnetically receptive material that attracts all types of magnets. VERSATILE USE- Perfect for menu boards, custom made To-Do boards, classroom activities, workshop meetings and much more! EASY USE- You'll just need to remove the release paper from the back and you can stick it almost anywhere! Easily cut the magnetic material into the size of your liking! Just write on & wipe off, it is that easy! Fast Free Shipping! 100% SATISFACTION GUARANTEED! If you have any questions about this product by Flexible magnets, contact us by completing and submitting the form below. If you are looking for a specif part number, please include it with your message.